You’ll still want your lipstick and phone on your wedding day, right? We have beautiful beaded evening bags from the 1950’s and 60’s that are the perfect size for essentials and pretty enough to match your wedding dress. Whether you need something to keep you warm or just a little extra coverage. We have gorgeous vintage, beaded cardigans, delicate lace boleros, tulle capes and cropped jackets. 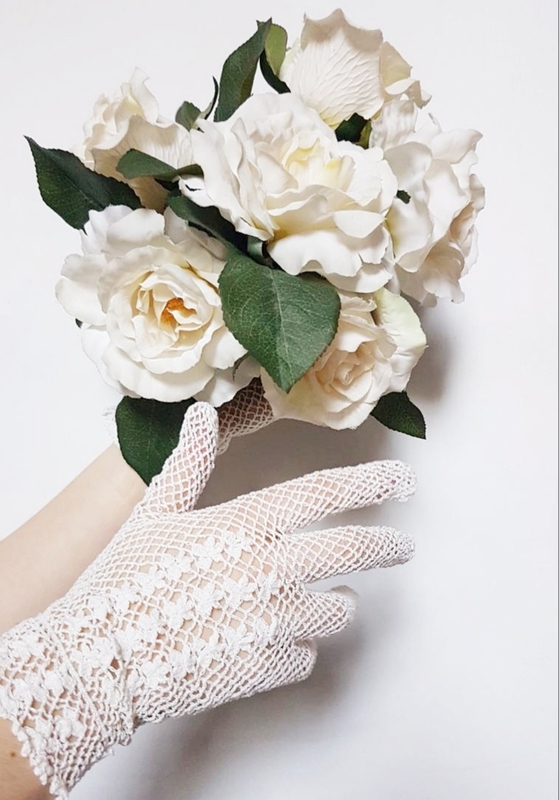 If you want to create a very vintage and glamorous look then gloves are a must! We have a huge collection in different colours and lengths, in simple and intricate styles. A touch of sparkle can be the perfect finishing touch. Our jewellery hails from the 1920’s on wards. We have stunning earrings, rings, bracelets and necklaces. There’s nothing quite like the sparkle and shine of vintage rhinestones. A little treasure you can wear and keep as a reminder makes a wonderful gift for any bride. Think vintage garters, Art Deco coin purses and delicate lace handkerchiefs. What better way of adding a touch of sparkle or colour than by adding a sash. It will define your waist and add extra interest to your dress. Our collection of new and bespoke sashes offer so much choice. We’ll help you pick the best style to suit your dress, whether it’s simple, fun, elaborate or chic. If we don’t have what you’re looking for, we can create one just for you. A fabulous option if you are looking to work in your bridal party colours!